Shot through the window glass last Saturday, while it snowed. Music is a Pandora holiday mix playing on the kitchen counter next to me. The seed that attracts the widest variety of birds, and so the best choice to offer, is sunflower. Black-oil sunflower seed. Bird feeding in North America took a major leap forward when black-oil sunflower became widely available in the early 1980s. Why do birds prefer it? The outer shell of a black-oil sunflower seed is thinner and easier to crack. The kernel inside the shell is larger than the kernel inside a white-or gray-striped sunflower seed, so birds get more food per seed from black-oil. This last fact also makes black-oil a better value for you, the seed buyer. Good mixed seed. Is there such a thing as BAD mixed seed? You bet! Bad mixed seed has lots of filler in it—junk seeds that most birds won’t eat. Bad mixed seed can include dyed seed meant for pet birds, wheat, and some forms of red milo that only birds in the Desert Southwest seem to eat. Good mixed seed has a large amount of sunflower seed, cracked corn, white proso millet, and perhaps some peanut hearts. The really cheap bags of mixed seed sold at grocery stores can contain the least useful seeds. Smart feeder operators buy mixed seed from a specialty bird store or a hardware/feed store operation. You can even buy the ingredients separately and create your own specialty mix. Sunflower seeds are the easiest type of birdseed to grow. You can plant seeds directly from your birdseed supply or purchase different varieties of sunflower seeds from nurseries and gardening centers. We usually plant a few special varieties in our garden (see chickadees on sunflower heads), but why not just dedicate a part of our back field to some bird food sunflower seeds from Agway? 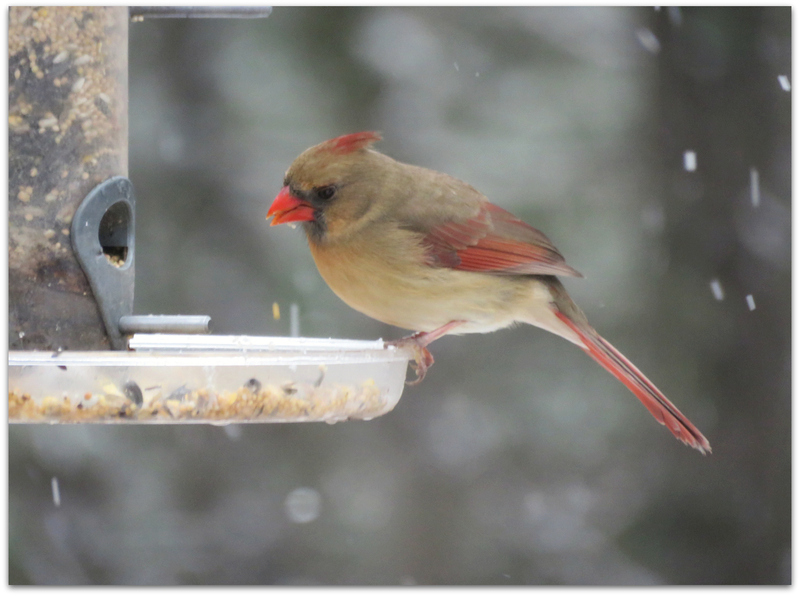 This entry was posted in Uncategorized and tagged backyard birds, bird food, birds, Cornell Lab of Ornithology, Northern Cardinal, sunflower seeds on December 17, 2014 by Amy.